"The Smart Light Sydney Festival aims to educate and engage audiences on the possibilities offered by low-energy, smart lighting design and products, through a number of innovative and exciting light installations and events." "Due to inefficient or badly designed lighting, a significant portion of the energy used by built environment lighting is given off as heat, or is wasted by lighting unused spaces and our cities' skies, rather than just their streets — so much so that the Astronomical Society of Victoria has reported that sky brightness in Victoria roughly doubles each decade. The adverse effects of light pollution on human health and psychology are only beginning to be understood. Lumenocity is an installation which documents and invites contemplation of the costs of Sydney's night time jewels. It is an abstraction of the city's CBD, illuminated by the glow of energy-efficient fluorescents. The humming sound of the lanterns in the installation, the sound of consumption, build up to a chorus and serve as a counterpoint to the delicate appearance of the miniature CBD, a salient reminder of the price of Sydney's luminous beauty." "Smart Light Sydney will showcase dynamic light art sculptures using smart technology with a free Light Walk around Sydney's iconic harbour precinct from Sydney Observatory, around the Rocks and Circular Quay to Sydney Opera House. This exciting new event, conceived by Sydney born lighting designer and composer, Founder and Artistic Director Mary-Anne Kyriakou, will also encompass the Art Light Exhibition and Smart Light Symposia at UTS and Licht, an orchestral and light art interpretation of composer Stockhausen's work at the Sydney Conservatorium of Music. The Light Walk and Art Light Exhibition public art displays will showcase beautiful new works from light artists and designers at the cutting edge of design from around Australia and internationally, including legendary musician and multimedia artist Brian Eno and Australian design luminaries Warren Langley and Ruth McDermott. Smart Light Sydney will not only excite audiences with dozens of beautiful and atmospheric light creations, it will inspire in its innovative approaches that reduce energy consumption, reduce light wastage and revitalise urban spaces. Smart Light Sydney is also a partner of the UN International Year of Astronomy 2009, highlighting the need for darker night skies through smart lighting in cities globally, and will celebrate Sydney Observatory's Festival of the Stars to showcase the opportunities for spectacular stargazing thanks to reduced light pollution." 1. 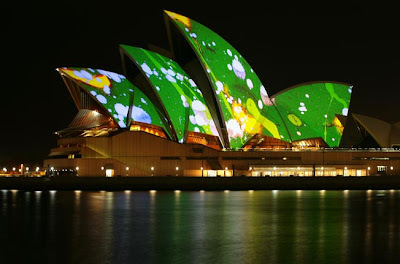 Opera alight ... the sails of the Sydney Opera House are illuminated by artwork by UK artist Brian Eno during a final test before the opening night of the Vivid's Smart Light Sydney festival. 2. Blues and greens ... artists Electric Canvas project their work Façade onto the front of the Museum of Contemporary Art. 3. On reflection ... the artwork Rocklights by German artist Ingo Bracke is reflected in the paint work of a parked car in the road tunnel running through the Argyle Cut. 4. Full of stars ... artists Electric Canvas project their work Façade onto the front of the Museum of Contemporary Art. 5. Sing a rainbow ... artists Mark Hammer, left and Landre Kecskes look up at their work Rainbow in place by the Billich Gallery in the Rocks. 6. Double Bubble ... artists Electric Canvas project their work Façade onto the front of the Museum of Contemporary Art. 7. In position ... Warren Lengley stands on top of the eight metre high vase that forms the base section of his Vessle of (Horti) Cultural Plenty and attaches one of the 15 fibre optic filled branches. 8. Giant light work ... artwork by Brian Eno is projected onto the sails of the Sydney Opera House ahead of the official opening of the Smart Light festival. 9. Peddle power ... the artist from Clouston Associates blur with the effort of illuminating their piece Cycle. Peddling the five modified exercise bikes lights the blue rings around the trees on the waters edge. 10. Flower power ... people stop to admire Warren Langley's Vessel of (Horti) Cultural Plenty in position by the Overseas Passenger Terminal. 11. 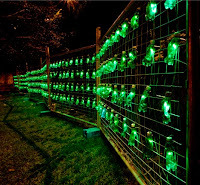 Green Lantern ... fencing on Argyle street plays host to Fire Flies by Swiss artist Frabcesco Mariotti. 12. Chequered ... artists Electric Canvas project their work Façade onto the front of the Museum of Contemporary Art. 13. Face Off ... Janus by Tom Barker and Hank Haeusler lies in wait at UTS before being transported to the Rocks for it's instillation. 14. Lotta Bottle ... Fire Flies by Swiss artist Frabcesco Mariotti uses recycled drinks bottles and low energy lights to great effect. 15. Red brick building ... artists Electric Canvas project their work Façade onto the front of the Museum of Contemporary Art. 16. Between the legs ... artists Warren Langley's Vessel of (Horti) Cultural Plenty is seen through the legs of a statue in Cadman Park by the Overseas Passenger Terminal. 17. Projection ... as part of this years Smart Light Festival the Sydney Opera House will have its sails illuminated from both sides by artworks by British artist Brian Emo. 18. Brooding skies ... with rain threatening at any moment we look up at Warren Langley's Vessle of (Horti) Cultural Plenty during it's construction. 19. The Matrix ... Dr Hank Haeusler looks up through the lattice work of the 6m long Janus. The giant 3D acrylic face is covered with 183 giant 'Pixels' and weighs 160kg. 20. Art Decoration ... artists Electric Canvas project their work Façade onto the front of the Museum of Contemporary Art. 21. Pool Lights ... the ultra low emission rechargeable lights that are being used to construct the giant 'pixels on the Janus face started life as simple floating pool lights. 22. Underbelly ... a view from underneath of the giant face of Janus. Each of the 183 giant 'pixel' lights is solar powered and computer controlled to give the face an amazing 3D quality when it is installed in later in the week. 23. Tunnel of love ... the underside of the road tunnel running through the Argyle Cut is illuminated with a work entitled Rocklights by German artist Ingo Bracke. 24. Light stick ... artist Warren Langley walks past one of the 15 'branches' used in his piece the Vessel of (Horti) Cultural Plenty. Each branch is filled with Nexxus lateral emission fibre optic cable, which is most commonly used to light the way to emergency exits on planes.